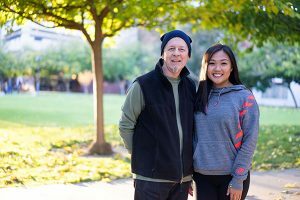 Like many students graduating in the Bay Area, housing concerns have often been on the mind of Laura Cayabyab, ’17 Sociology. While she said her parents have a home in Silicon Valley in which she is welcome, her greatest academic and personal passion has been to find solutions for the growing dilemma of homelessness in one of the nation’s most expensive housing market. 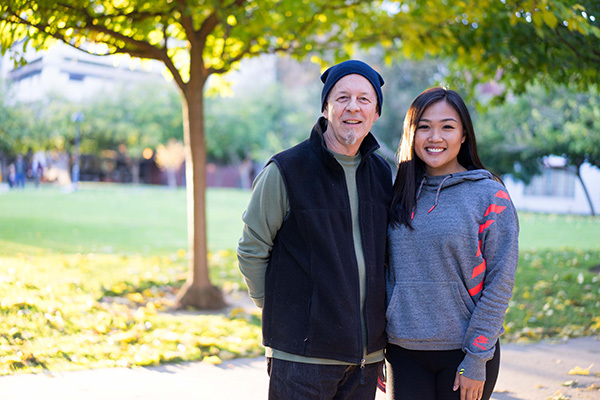 A December graduate, Cayabyab turned her concerns into action, serving as president of COOP SJSU for the past year. The student organization addresses pressing social issues on campus and the greater San Jose community. She and fellow COOP officials, including Ryan Eckford, have spearheaded drives on campus to collect clothing and hygiene items to distribute to the homeless. Cayabyab said a 2016 study revealed about 300 of SJSU’s 33,000 students are homeless—the definition includes students who live in cars, on the streets or who “couch surf”. The number of homeless people in San Jose on any given night is estimated at 5,000. The Bay Area’s largest city has among the highest rents in the nation—according to website Rent Jungle, the average monthly cost for a one-bedroom apartment in San Jose in November was $2,430. As one of her last official acts as president of the student organization, Cayabyab and Eckford helped organize and lead a discussion on the region’s housing crisis last month at an On The Table event, sponsored by the Silicon Valley Community Foundation (SVCF). The nonprofit organization is the world’s largest philanthropic community foundation, with $8 billion in assets under management. Two dozen students, staff, faculty and lecturers attended, along with representatives of the City of San Jose and Santa Clara County. Cayabyab and Eckford also received assistance in organizing the event from Carol Stephenson of People Acting in Community Together (PACT), a multi-faith, multi-ethnic grassroots social justice organization. About a week later, the COOP students attended another On The Table event at the foundation’s Mountain View headquarters. Leaders of community organizations from throughout the Bay Area attended. Michael Fallon, who retired as adjunct professor of sociology at SJSU in June, has been involved in the COOP organization at the faculty level in recent years. He said the group was founded to address pressing social issues in Silicon Valley, primarily focused on housing the homeless. Fallon also served as Director of the Center for Community Learning and Leadership at SJSU, which has focused its efforts on cleaning up the pollution of Coyote Creek as a result of the former homeless encampment of several hundred people that was closed down three years ago. Known as the Jungle, the infamous camp became a symbol of the haves and have-nots in Silicon Valley. Fallon said he has been happy to be a catalyst himself in sparking social awareness and the ability to devise practical solutions to seemingly intractable societal ills.